General Tech Any good ideas for removing liners? Any good ideas for removing liners? I'm working on a second engine, which came with my TR4A. It's a TR4 engine. I'm at the point of removing the cylinders, but they are really tight. Pounding away on a wood block hasn't worked, nor has using an aluminum block instead of the wood. I am reluctant to be more aggressive, as I don't want to risk cracking the block. The problem is complicated by the fact that two pistons are seized in their cylinders. For that reason, tricks like making a puller won't work, at least not on those two cylinders. I'm thinking of pouring something into the coolant area, maybe phosphoric acid or a weak solution of muriatic acid, and letting it sit for a day. Or, something like that. Any other, maybe less scary ideas? I don't care about the cylinders or pistons; obviously, they will have to be replaced. Im sure you’ve tried solvents and such, but Kroil is moving up on my list of most effective penetrating oils. I would give that a try along with a good aluminum drift...I made mine out of 1.5” square stock about a foot long. If that doesn’t work, clean out the oil and give phosphoric acid a try, but don’t let it dry. Good luck and let us know how it works out. I made up a 'drift' long ago that seems to work pretty well. It's just a length of galvanized water pipe, with an iron cap on one end, and a hex brass cap on the other. I put the brass against the edge of the liner, and whack the other end with a 3 or 4 pound sledge, then move to the opposite side and repeat. For the stuck pistons, just go after them with a long cold chisel. They break pretty easy, and as you pointed out, you don't have to worry about damaging the liners. 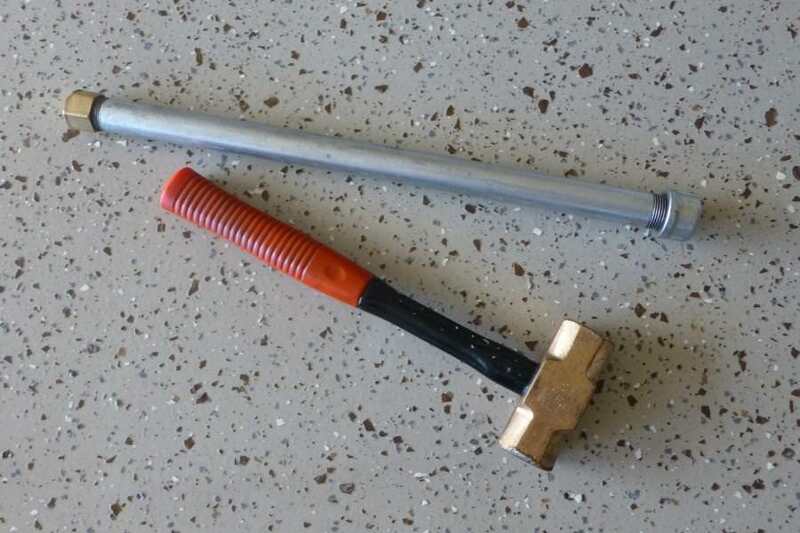 I've never needed a puller, but the idea sounds interesting to me. Be sure to spread out the load on top of the block though, that upper surface is surprisingly fragile. I made a drift, from Randall's instructions I think, and it worked for three. The fourth wouldn't budge so I put it on a big press and pushed on the piston which was stuck also. That broke the liner just below the piston which so I pressed the piece out separately. Luckily, I did not damage the block. Next time I'll use the chisel and get some Kroil. I also used a 'Randall' on mine - really has a 'something's gotta give' feel when you whack it with a 3 lbs hammer (about all I could swing while laying on my back). Guess I am "backwoods" on removing pistons. Years ago Dad whittled a piece of hickory firewood down to the size it would just fit inside the liner. A couple of licks with sledge hammer and piston is out. No problem with liners but imagine I would do the same with them. I purchased a new 64 TR4 in the spring of 65. and replaced the pistons and liners I don't remember any trouble removing the liners probably because of the age of the car at the time so this would not be of any help. The reason I am posting this trivia is that I remember reading, at the time, an article that was recommending every 12,000 miles or so that removing the head and rotating the liners 1/4 turn could extend the engine life by reducing wear or causing a more even wear pattern. I do also remember thinking it seemed quite silly. I never tried it and have never heard of it since. I believe bores tend to "oval" over time, and not simply wear into a bigger and bigger round hole, so this probably makes sense to do if it was as easy to do as rotating your tires and changing you spark plugs. Guys, thanks for the suggestions. As with many things, I think this is a case where you try a bunch of things and eventually one works. I didn't have this problem with the engine now in my TR4A chassis; the cylinders needed only a decent whack with a hammer and wood block. There are a couple examples of pullers on the internet. They are all variations on a theme--a block under the liner, some threaded rod, and a bridge at the top. Tighten the thing and maybe give it an extra whack from underneath. Kinda like I do with tie-rod ends. I do have a three-pound sledge. Next, off to Lowes for some plumbing bits...! I got the li'l buggers out! I found a piece of aluminum that was about the right size, used it as a drift, and gave one a whack with a small sledge. After a couple hits, I could feel the first one moving a bit, and it got easier as it moved farther. The rest required about the same effort. I still have two pistons stuck in their cylinders. One is no longer frozen, but it will take some force to get it out. I will try my press on them. If that doesn't work, I'll cut the little mothas apart with an angle grinder and cutting disk. The only things I need are the connecting rods; the rest is trash. Thanks again for the suggestions. Sometimes, it's helpful just to discuss these things--it gets ideas flowing. Woohoo! If something goes wrong and a rod gets injured, the MaxSpeedingRods are really nice and they’re cheap. I’ve bought a few sets for LBCs between $250 and $300 and when I compared them with resizing, reducing weight, balancing, and adding ARP hardware it was pretty close. Use the same sledge on the crown of the pistons and they'll break out in one big whack! In the end, I just cut the cylinders with my angle grinder. Took about a minute each, then just a tap with a hammer and chisel to break the halves apart. It's funny, here in LA we always expect everything to be stupidly expensive, but there are bargains everywhere if you look for them. With my first engine, I was sorely tempted by the MaxSpeedingRods, but in the end, the desire to keep costs down won out. I paid $215 for all the machine work, which included sizing the rods and inserting/reaming the small-end bushings, regrinding the crank, resurfacing the flywheel, and balancing everything. They did a nice job; I checked all the dimensions, and everything was right. That is a good deal! I usually pay that for the balancing alone. Who did your machine work, Steve? I'm gonna need some of that myself in a few months. They also go by Ali's Machine Shop. Dunno the reason for the name confusion--maybe the business was sold. The details--$55 to regrind the crank, $12 ea. to recondition the rods, install bushings, and hone them, $22 to resurface the flywheel, and $100 for all the balancing. I had remembered $215 but it actually came to $225. Wow, that’s a really good price for everything! I think it's the same Ali's, but it moved. Based on Yelp and recommendations, I tried to take my stuff to the Signal Hill location, but it was gone. As for the pricing--I know a crank grinder in South LA that will regrind a four-banger crank for $35. I had my MG TD crank done by them. Kind of a creepy part of town, and their building looks like a place someone would take you to murder you, but they did a nice job.